The minds behind the movie "Ender's Game" had a little help bringing their version of the beloved science-fiction book by Orson Scott Card to life. "Ender's Game" focuses on the life of the gifted child, Ender Wiggin, a boy recruited to leave Earth and head to Battle School — a future space station orbiting the planet — to learn how to stop an alien race from pushing the human race into extinction. Much of the action in the Battle School takes place in the battle room — a weightless part of the station where teams of students train and battle during strategic games with one another. Astronaut Greg Chamitoff, Expedition 17 flight engineer, takes a moment for a photo as he works in the Destiny laboratory of the International Space Station while Space Shuttle Discovery is docked with the station in 2008. "It was a great time because the kids are very smart, and they're curious," Chamitoff told SPACE.com. "They want to make things look right, and they had terrific questions. We kind of spent time pushing off the walls and bouncing around the room and pretending we're in zero gravity." Chamitoff found that some of the young actors he trained thought that moving in zero gravity was like moving in slow-motion, similar to underwater movement. But Chamitoff, who has clocked more than 198 days in space, explained that isn't actually the case. Astronauts on the International Space Station may seem to move more slowly than they would on the ground, but that isn't because they don't have the ability to move quickly in microgravity. People in space don't need to turn their heads slowly or move their extremities more slowly than they would on Earth, Chamitoff said. "When you move from one place to another, you tend to push off carefully and hold on until the last second so you get exactly the path you want aiming at some handhold or something somewhere else," Chamitoff said. "Then, when you get to the other end, you have to absorb all the energy you put in by pushing off. So, you don't push really hard because then you'd have to smash into something … That doesn't mean you can't be moving like crazy, really fast on your way somewhere." Chamitoff also gave the filmmakers videos and photos he took while in space. "[I provided] photos of the Earth, which they modified, but they use [the photos] in some of the imagery in the movie," Chamitoff said. "I can recognize it. When I see it in the movie, I say, 'Hey, I remember taking that picture right there.'" 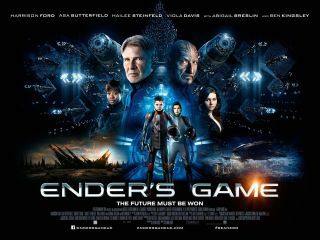 "Ender's Game" even caused Chamitoff to flash back to life in space briefly while he was watching the film. As the Battle School students float out into the battle room for the first time, the view of the Earth stretching out beneath them reminded him of his life on the space station. Matthew Butler, the visual effects supervisor for the movie and Chamitoff's roommate in graduate school, asked Chamitoff to advise on the film. Butler used his knowledge of math and physics to produce accurate spaceflight scenes, Chamitoff said. "['Ender's Game'] was really amazing," Chamitoff said. "I expected it to be perfect. I expected it to look perfect, because I know that Matt [Butler] puts math in behind it." "Ender's Game" opens nationwide in the United States on Nov. 1.